Heat ridged grill pan over medium-high heat (or prepare outdoor grill for direct grilling over medium-high heat). Pound chicken to uniform 1/4-inch thickness if necessary. From lemons, grate 1 tablespoon plus 1 1/2 teaspoons peel and squeeze 3 tablespoons juice. In large bowl, whisk lemon peel and juice, oil, 2 tablespoons mint, 1/2 teaspoon salt, and 1/2 teaspoon pepper until dressing is blended. Reserve 1/4 cup dressing. In large bowl, toss chicken cutlets with remaining dressing. Place chicken in grill pan and cook 4 to 5 minutes or until juices run clear when breast is pierced with tip of knife, turning over once. 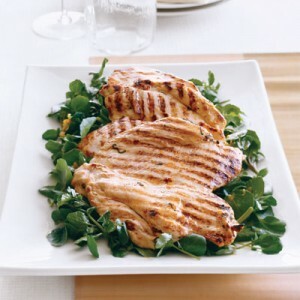 To serve, toss watercress with reserved dressing and top with chicken. Sprinkle with additional chopped mint for garnish.